Conservative Candidate For President" "
"Common sense is in spite of, not the result of, education." "Government corruption, overly complex legislation, bureaucratic inefficiency and over-educated academic idiots smother COMMON SENSE." Without honor in the people and in government, there can be no freedom. Position, perceived importance and the almost assured corruption that results there from, always poisons the well of honor if men are not, by nature, honorable. That brings us to the subject of this article. In about one second you are going to think that the conservative author who has been writing the articles you have been reading for these last 10 years, has lost his mind. Not hardly! It is said that anyone can run for president in America ….. and win. Over the ten years we have been writing articles on freedom and property rights, we have had several readers suggest we should run for president and others who said they would vote for us, if we did run, even if the idea is nothing more than a fantasy. We have resisted the idea for many reasons, the first being, only a fool would subject him or herself and their family to the kind of media scrutiny and feeding frenzy that a presidential candidate must endure, especially a conservative candidate. However, with the plethora of candidates now allegedly running for the conservative ticket and many of those candidates just a replay of the same old tired political games, we have decided to explore the possibility of being a serious candidate for President, as improbable as that might seem. There must be a thousand reasons why we shouldn't run, but if you are wondering why we would make such a bold move, all you need to do is read our last 500 articles describing the down hill slide of America, directly caused by Progressive policies. We can't stand by and watch that happen to the country we love without doing something more than just writing articles. We have over 40 years of hands-on business experience as an entrepreneur employing many people; we worked with the federal and state government as a contractor, we have over 30 years in land use and real estate investment experience giving us a broad knowledge of the law and how government works; we wrote a book on real estate fundamentals and how to develop property; we served on a local government planning commission; we served eight years with a major city chamber of commerce as a director and vice president; as a pro se attorney we personally sued a multi-national corporation and won: we have become a nationally known conservative author; we are well read in most of the science disciplines; have significant knowledge of American history and equally important, we have the wisdom of age. Our education came from graduating from the school of hard knocks and we don't back down from bullies. We are blessed with good health and boundless drive and energy. Have we made mistakes, of course, everyone does. But why would we be any less qualified than a community organizer from Chicago whose only attributes are that he is arrogant, a narcissist, a reverse racist, devoid of honor and has a radically distorted view of America from which he governs? "First he comes for the banks and health care, uses the IRS to go after critics, politicizes the Justice Department, spies on journalists, tries to curb religious freedom, slashes the military, throws open the borders, doubles the debt and nationalizes the Internet. He lies to the public, ignores the Constitution, inflames race relations and urges Latinos to punish Republican “enemies.” He abandons our allies, appeases tyrants, coddles adversaries and uses the Crusades as an excuse for inaction as Islamic terrorists slaughter their way across the Mideast." This is how Obama has governed America for six years and it is tragic if not treasonous. It is obviously not how we would govern. Many of our readers will say we haven't a chance to be nominated as the Republican front-runner to face whomever the Democrats finally bring to the fore and they might be right. But before the reader makes up his or her mind, we ask that he or she review the platform we would put forth under the banner "A Common Sense Conservative Candidate". The reader may just find that they agree with our platform more than they disagree. Most of our platform came from the "18 Principles For A Free America" we wrote several years ago that appears on our website. Our platform could very well be used to compare against the platforms of the current cadre of conservative presidential candidates. We lean heavily towards strict constitutionalism and free enterprise. On the domestic front, the down sizing of government and the privatization of many government functions would be one of our first priorities. Elimination of many government bureaucracies would be the second priority. Shaking up the IRS and the EPA and other out-of-control cabinet level agencies, repealing and replacing Obama Care and closing the border would be the third. On the foreign front we will take very seriously the constitutional clause and oath that requires the president to protect and defend the American people from all enemies, foreign or domestic, not forgetting America has many domestic enemies as well as foreign. Most of the domestic enemies fall into the flawed ideology of Progressivism that has led us down the path to financial ruin and the continuing loss of liberty. We guarantee everyone that we would not back down from, or appease national or international bullies, no matter how large or small they may be. Our administration would be one of inclusion and transparency, to the best of our ability and transparency will not be just a campaign slogan. We do not intend to follow in the footsteps of the current president, or the alleged, presumptive Democrat, seriously flawed, hopelessly corrupt, female front-runner. Re-election to a 2nd term, or party considerations, will never be factors in making decisions for America and the American people. To get our common sense message out to the public, we will need supporters to set up speech venues for us in every state, obtain petitions to put us on the ballot in each state and provide the funds for our expenses. We will also need a pro bono legal firm to make sure we comply with all political campaign laws. To embark upon this kind of effort, is not only time consuming, it is expensive. Without the support from thousands of those of like mind, the effort is futile. For now, we will be exploring the possibilities of running for president by using specific web pages on our existing NARLO website, as we did with our Platform. NARLO is a nationally known organization and our website receives considerable traffic. Early funding for exploring the possibility will come from the sale of NARLO products, memberships, or donations. 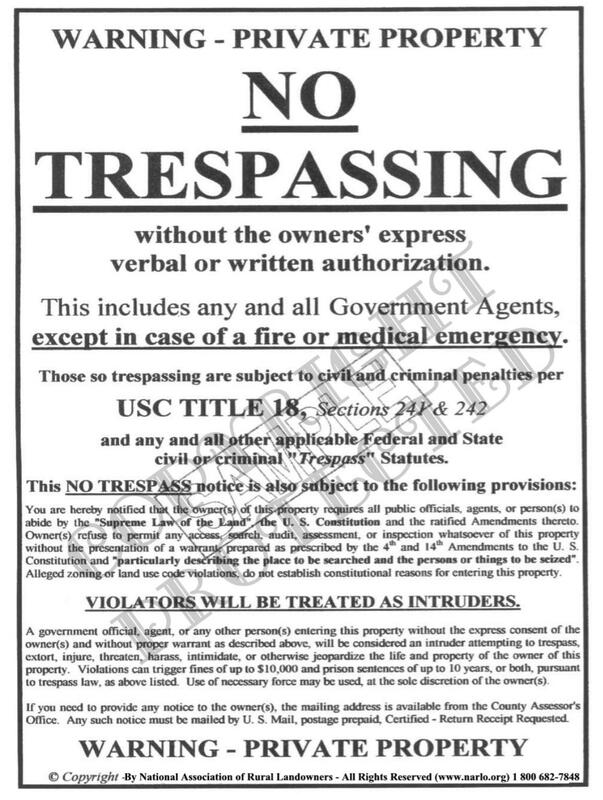 Thus, we are asking that you help us with DONATIONS and tell your rural landowner friends about our powerful, legally intimidating 18" x 24" aluminum No Trespassing sign and our unique, one-of-a-kind Rural Landowner Handbook that is not available anywhere else. In addition, we have uploaded 4 years (over 200) of our copyrighted weekly articles to a USB Flash Drive in Microsoft WORD format. If you have enjoyed our articles and want an in depth glimpse into our general philosophy and how we would govern, we have made the articles available at the following link: ARTICLES. Even if we don't win which is quite possible, it will give us a large platform and a much larger audience to extol the virtues of this great county and perhaps change some minds along the way. Then hit SEND after clicking one or more of the links. We will assess the responses and make our decision. If this article goes viral, as we hope it will, we might just have a shot.